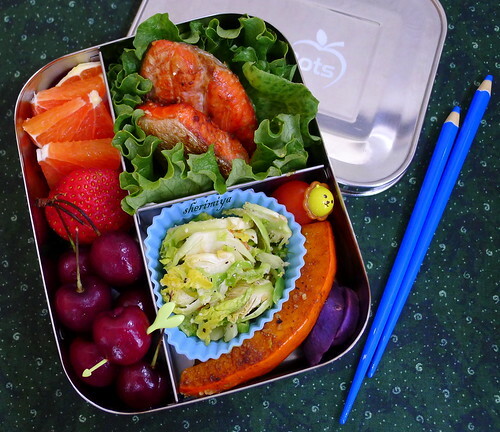 Salmon Trio Bento, a photo by sherimiya ♥ on Flickr. Today's Lunchbot Trio is packed with the salmon of the week, roasted in olive oil and shoyu. I also roasted some thinly sliced Brussels sprouts, after tossing with fresh-ground pepper and Parmesan. The kabocha slices were -yep!- roasted as well in the fish pan. There was just enough room in the vegetable section to slip some steamed Okinawan sweet potatoes and a grape tomato in there. The longitudinal fruit section holds cara cara orange wedges, a strawberry and some cherries. How handy is this box? This bento didn't take any time at all to pack. Of course, there aren't any cute details, but nothing that a few food picks can't fill in. Even on a busy midweek day, you can still find a few minutes to pack a cheerful lunch for yourself or your child. And to be honest, I always choose divided boxes on days like this because half the job of organizing the food is already done for me. I really recommend to have at least a couple of these boxes on hand. My other go-to is my round divided box (see it in action recently here). Happy Wednesday! Cherries! Yay! Don´t worry about my eagle eyes Sheri... most of the time they do not work at all :P. I was wondering the size of your grapes when I notice those cherries in the other bento meal ^^. I never saw the Trio box before, in my opinion much nicer than the Duo box. I found a local website where they sell the lunchbots, so I might finally get my hands on one of them :o) Contents-wise nothing to add : salmon is always a winner and you managed to put lots of colour and variation into this one again. Before I saw the Trio I was totally happy with the Duo. Then I had to have the Trio. Now that there's a Quad... what do you think? Thank you as always for your comments and opinions. I appreciate them Ceinwyn! Today was a treat - got to catch up on all your bentos that I've missed recently! Love, love, love all of them and it was kind of fun to look at one after the other, hehe :) You always make wonderful use of your Lunchbots boxes! Now I'm craving roasted kabocha. How is TS doing? Always so glad to catch you on the blogs or on twitter. You're always so positive and uplifting. TS is coming along well; in fact it seems she is starting to get up to her usual antics again, which I suppose means she is starting to heal! Nami, I love this Trio box; it would be great for packing rice separately. My kids aren't big fans of rice; or maybe they just don't like cold / room temp rice -- so I rarely pack it in bento. If I could make onigiri, it would be easier to make cute charaben. Oh well; I'll leave that to you! Thanks Nami! The rich colors here put me into a trance of happiness! Jenn, you are so sweet. Thank you dear!